Despite generally making their name in the Summer Of Funky (a.k.a. 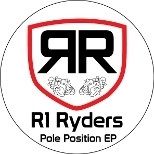 the last summer that anyone actually went into Uptown Records), R1 Ryders have links to dubstep's Anti-Social Entertainment collective, and on 'Pole Position', they're starting to sound a lot like Silkie and Quest doing breakneck house, combining jazzy synth melodies with wobble bass. That's not necessarily a bad thing, but it doesn't always come together: 'Mars' and 'Basswave' just feel a bit ploddy to me, especially considering how kinetic R1 Ryders classics 'Rubberband' and 'Hydraulic' were. Far better is 'Deep In The Jungle', which bombs along with heavyweight propulsion and features one of the best hands-in-the-air breakdowns you'll hear anywhere this month.